And they claimed the win without some of their top players. “We missed some players during this competition, but we always believed in ourselves. There were several difficulties while preparing for this championship, but they only toughened us up and we came and proved that here,” said coach Mikhail Nikolaev. Russia were forced to fight in nearly every match, but eventually emerged triumphant after seven wins in eight days against national teams from Tunisia, Brazil, Argentina, Turkey, Mexico, Italy and Turkey again, in the final. “It was a very difficult tournament. Preparing for the tournament was also hard for us. For example, our opposite Alexander Kimerov is a middle blocker. But we believed in victory,” said Nikolaev. Coach Nikolaev also had to make do without possibly the most talented volleyball player in the country – outstanding hitter Victor Poletaev – as well as Ilya Vlasov and Ilya Kurkaev. 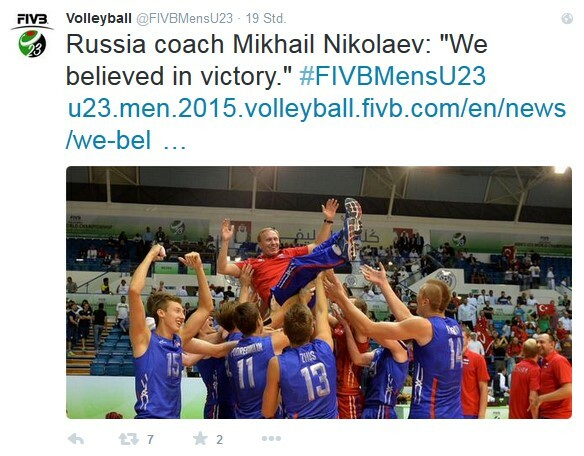 The gifted trio were busy with Vladimir Alekno and the senior national team, preparing for next week’s FIVB Volleyball Men's World Cup, at which two tickets to the 2016 Olympics are up for grabs. The fact that Russia still came through to take the title is a demonstration of the overwhelming wealth of talent currently coming through the junior ranks into the men’s game in the country. Igor Kliuka’s was the final's match-winner with 20 points and was subsequently named Best Outside Spiker and MVP. The most effective hitter in the list of the top-ten scorers at the World Championship is originally from Belarus, but recently took Russian citizenship and has set about amassing quite a collection of titles. Before the U23 World Championship, he also won bronze at the inaugural European Games in Baku and gold at the Universiade in Gwangju. “Honestly, I did not expect to win the MVP award. The emotions are incredible. We are the best in the world, and this is important! Thanks to the whole team. When we are united, we are invincible,” said Kliuka. Pavel Pankov also played an important role in the Russian success. He only turned 20 on August 14, but is already a complete player, whose attacks are as feared as his blocks. Even as a setter, he was the champions’ second-highest points scorer in the final with ten points. The Pankov family is one of the most famous volleyball dynasties in Russia. Mother Marina Nikulina (Pankova) won Olympic gold with the Soviet Union in Seoul in 1988. Father Vadim was in charge of the second Russian women’s team at the inaugural European Games in Baku this summer, and also coaches top club Odintsovo. Sister Ekaterina Kosianenko (Pankova) was crowned European champion with Russia in 2013, finished third in the 2015 FIVB Volleyball World Grand Prix, and is currently battling for a ticket to the 2016 Olympic Games in Rio de Janeiro at the FIVB Volleyball Women's World Cup. He has now proven his value against the world’s top volleyball players at various championships. The title at the FIVB Volleyball Men’s U23 World Championship in Dubai means he has now won gold medals in every possible age group. 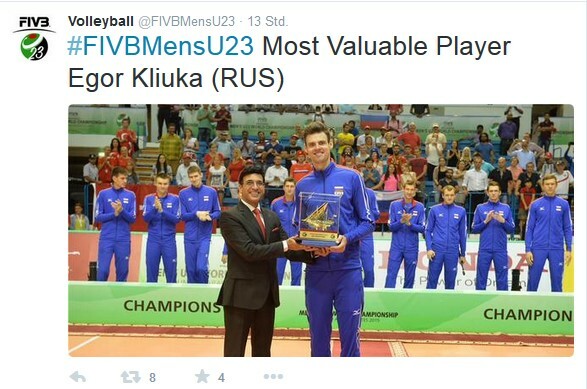 In 2013, he won gold with Russia at the FIVB Volleyball Boys' U19 World Championship, where he was also named MVP. 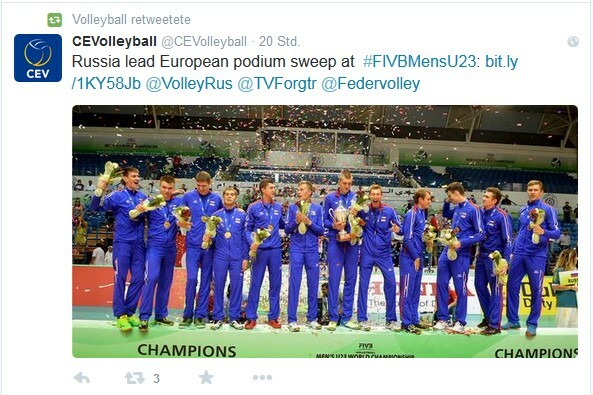 Not long after that, he came away from the FIVB Volleyball Men’s U21 World Championship with the title. His congenial partner there was Victor Poletaev, MVP and top scorer. Pavel, however, now has one title more than his partner in success.